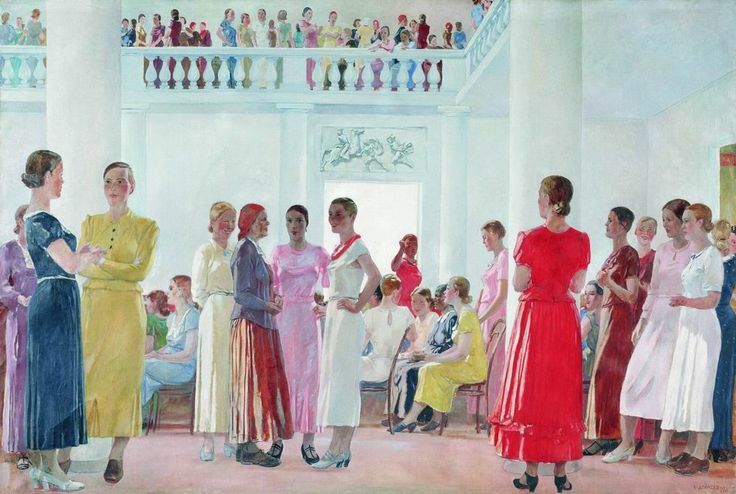 Beauty has a woman’s face: an opinion shared by many artists of all eras; Soviet ones were no exception. Thus among the PASTORAL and genre scenes, so frequent in Hotel Ukraina’s art collection, a woman’s silhouette appears every now and then, enlivening and adorning the landscape. One such painting is Landscape with a Train, by the famous Aleksandr Deineka. A speeding train occludes the horizon and cuts a pine forest in two - while in front, a girl in red is walking hurriedly down a footpath. Painted in 1948, this watercolour reflects the country's post-war anxiety; one had to invent things that would raise one's spirits. And thus the creator of The Defence of Sevastopol had found his romantic scene. As painting subjects go, a woman in red has been a perennial favourite. 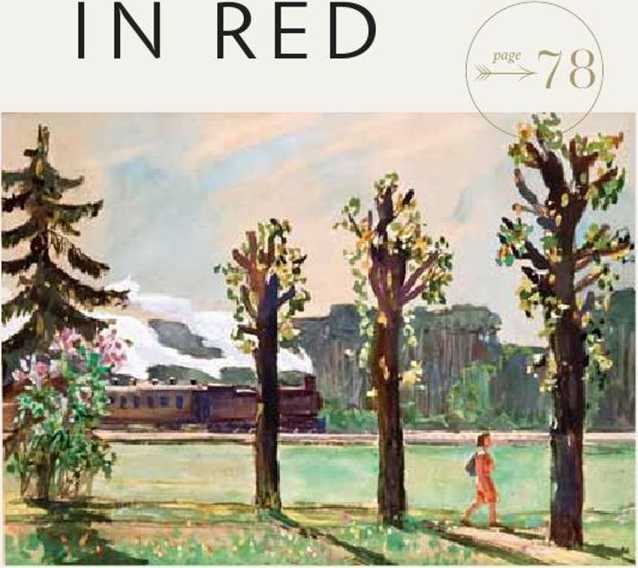 We see one in On the Boulevard (1956), by Deineka's student Grigory Gordon, among the briskly walking boys and men clad in black and white; a peasant woman in red appears in Lev Aronov’s Summer Evening, from the same year. A woman in scarlet is sitting on the sand in On the Seashore by Vasily Meshkov, one of the last Itinerants whose works are exhibited at the Tretyakov Gallery and the Russian Museum. A little girl in red is running after her mother and aunt in Valentina Nechayeva’s Arkhipo-Osipov- ka, against a mountainous background placing the scene in Gelendzhik. The artist, by the way, is more famous for her work on some of the classic Soviet animated films. Red Square, by Joseph Gurvich (dubbed by some ‘the Russian Cezanne’), has a woman and a little girl in the foreground - the girl’s red dress vaguely reminiscent of the little girl in a red coat appearing in Stephen Spielberg’s black-and-white Schindler’s List. Then there is At the Summer Cafe, by David Rubinshtein - who, like Gurvich, hailed from Odessa but was fond of painting Moscow. The scene, showing a mother and her small daughter sitting at the table, with a waitress leaning in - is perhaps among the nearest the Soviet 1950s came to glamour, something of an outspoken wish, considering how rare such idyllically neat cafes were at the time. Or take Ksenia Kupetsio’s meticulously detailed watercolour Tretyakovsky Drive - a simple scene with two women at a soda stall, one selling, the other buying, yet somehow foreshadowing the boutique-lined Tretyakovsky of today. Much in the same vein are Stepan Dudnik’s By the Sea (a woman sitting under a sunshade on a Crimean beach) and Girl Reading in the Garden by Yekaterina Zernova, likely also set somewhere in Alupka or Massandra. Her purple dress contrasts with the lush green; her shadow is almost solid on the sun-whited flagstones; there is something theatrical about her posture - which is no accident, seeing as Zernova had worked as a costume designer at the MalyTheatre. 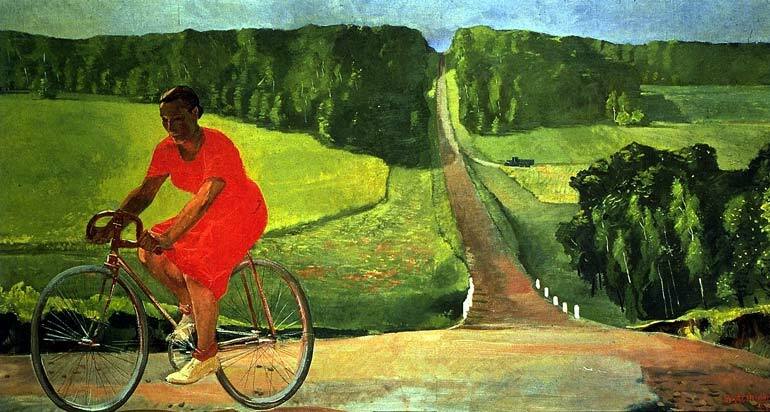 Speaking of contrasts: there is a striking one between the Black Sea and its adjacent Azov Sea, between the resort and the fishermen’s village - the latter depicted by Mikhail Kupriyanov's (of the Kukryniksy) 1956 painting of a lone woman walking along a sandy headland. More of village life, with no men in sight, appears in Mukhanov’s Sunny Morning (busy women in a village street) - and Vasily Kurma- nayevsky’s gloomier evening landscape with a shepherdess driving cows home. And Vasily Reshetnikov (brother to Fyodor Reshetnikov, who painted the iconic Low Marks Again) large painting of barefoot collective farm girls (who admittedly look more like students from Moscow) has yet another woman in red, standing out among all the white dresses and blouses, catching the eye, as if beckoning towards some faraway and splendid place.